Eight years ago, in the waning days of the Bush Administration, the EPA tried to issue new standards for radioactivity in drinking water that would have increased permissible concentrations by factors of hundreds, thousands, or even more, above the longstanding Safe Drinking Water Act limits. Bridge the Gap was instrumental in getting those proposals blocked at the very last moment. Now, in the last days of the Obama Administration, the same people within EPA’s radiation office are trying to push the proposal through again, with even higher concentrations than the Bush EPA had proposed. Once again, Bridge the Gap is helping lead the fight against this extraordinary relaxation of public protections. Polluters, however, never give up, so they have gotten their allies within the radiation office of EPA to propose new drinking water standards in the guise of “Protective Action Guides” or PAGs. The PAGs cover all radioactive releases for which a protective action might be considered, and are for the intermediate period after a release has been stabilized, lasting up to several years. 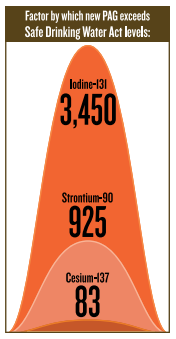 The new PAGs would increase the amount of strontium-90 allowed in the water you drink by a factor of 925 and the amount of iodine-131 by 3,450 times. Bridge the Gap has led a coalition of dozens of environmental and public health groups in opposition. We twice briefed top EPA leadership in Washington, D.C., including Gina McCarthy, the then-Assistant Administrator for Air and Radiation and now the outgoing EPA Administrator. Working with Public Employees for Environmental Responsibility and using the Freedom of Information Act, we were able to pry embarrassing documents out of EPA showing that under EPA’s own internal analyses of the proposed PAGs, drinking even a single small glass of water with particular radionuclides could give you a lifetime’s permissible radiation exposure. We briefed the White House Office of Management and Budget, which has to approve all such new rules. We put together joint opposition comments from more than 60 groups and helped stimulate more than 60,000 other written comments urging the rejection of the proposal. We also helped trigger coverage in the Wall Street Journal and television news, and tough questions for Administrator McCarthy at the National Press Club. As we go to press, the outcome remains uncertain. On December 1, McCarthy gave final approval to the rest of the PAGs, all but the drinking water section, which she said is on a separate timetable. We don’t yet know if the public attention we helped generate has resulted in McCarthy kicking the drinking water controversy to the next Administration, or whether she will still sign off on her way out the door. It does appear, however, that our efforts contributed to some of the worst, anti-environmental parts of the remaining PAGs being withdrawn. The fight over radioactivity in drinking water will persist. 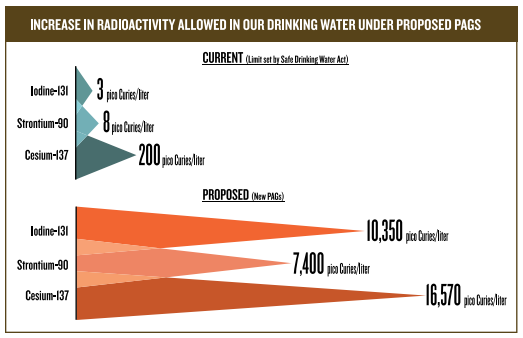 We will continue our work to prevent the public from having to drink water with radioactivity hundreds or thousands of times higher than has long been set as acceptable. Safe water is an undeniable right.